Textbooks are an increasing cost to students. Some textbooks cost $200 or more, and in North America a university undergraduate may be required to spend between $800-$1,000 a year on textbooks. 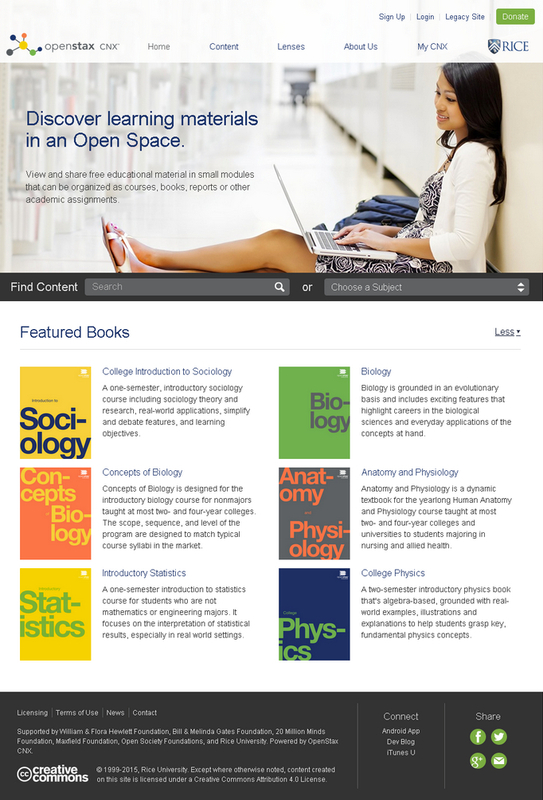 An open textbook on the other hand is an openly-licensed, online publication free for downloading for educational or non-commercial use. You are currently reading an open textbook. There is an increasing number of sources for open textbooks, such as OpenStax College from Rice University, and the Open Academics Textbook Catalog at the University of Minnesota. In British Columbia, the provincial government is funding the B.C. open textbook project, in collaboration with the provinces of Alberta and Saskatchewan. The B.C. open textbook project focuses on making available openly-licensed textbooks in the highest-enrolled academic subject areas and also in trades and skills training. In the B.C. project, as in many of the other sources, all the books are selected, peer reviewed and in some cases developed by local faculty. Often these textbooks are not ‘original’ work, in the sense of new knowledge, but carefully written and well illustrated summaries of current thinking in the different subject areas. Students and governments, through grants and financial aid, pay billions of dollars each year on textbooks. Open textbooks can make a significant impact on reducing the cost of education. There are also other considerations. It is a common sight to see lengthy line-ups at college bookstores all through the first week of the first semester (which eats into valuable study time). Because students may be searching for second-hand versions of the books from other students, it may well be into the second or third week of the semester before students actually get their copy. Cable Green of the Creative Commons has pointed to research that shows that when first year math students have their textbooks from the first day, they do much better than students who often do not get the key textbook until three weeks into the course. He also pointed to research from Florida Virtual Campus that indicates that many students (over 60 per cent) simply do not buy all the required textbooks, for a variety of reasons, but the main one being cost (Green, 2013). So why shouldn’t government pay the creators of textbooks directly, cut out the middleman (commercial publishers), save over 80 per cent on the cost, and distribute the books to students (or anyone else) for free over the Internet, under a Creative Commons license? Cable Green’s ‘vision’ for open textbooks is: 100 per cent of students have 100 per cent free, digital access to all materials by day one. Murphy (2103) questions the whole idea of textbooks, whether open or not. She sees textbooks as a relic of 19th century industrialism, a form of mass broadcasting. In the 21st century, students should be finding, accessing and collecting digital materials over the Internet. Textbooks are merely packaged learning, with the authors doing the work for students. Nevertheless, it has to be recognized that textbooks are still the basic currency for most forms of education, and while this remains the case, open textbooks are a much better alternative for students than expensive printed textbooks. Quality also remains a concern. There is an in-built prejudice that ‘free’ must mean poor quality.Thus the same arguments about quality of OER also apply to open textbooks. In particular, the expensive commercially published textbooks usually include in-built activities, supplementary materials such as extra readings, and even assessment questions. Others (including myself) question the likely impact of ‘open’ publishing on creating original works that are not likely to get subsidized by government because they are either too specialized, or are not yet part of a standard curriculum for the subject; in other words will open publishing impact negatively on the diversity of publishing? What is the incentive for someone now to publish a unique work, if there is no financial reward for the effort? Writing an original, single authored book remains hard work, however it is published. Although there is now a range of ‘open’ publishing services, there are still costs for an author to create original work. Who will pay, for instance, for specialized graphics, for editing or for review? I have used my blog to get sections of my book reviewed, and this has proved extremely useful, but it is not the same as having top experts in the field doing a systematic review before publication. Marketing is another issue. It takes time and specialised knowledge to market books effectively. On the other hand, my experience, having published twelve books commercially, is that publishers are very poor at properly marketing specialised textbooks, expecting the author to mainly self-market, while the publisher still takes 85-90 per cent of all sales revenues. Nevertheless there are real costs in marketing an open textbook. How can all these costs be recovered? Much more work still needs to be done to support the open publishing of original work in book format. If so, what does that mean for how knowledge is created, disseminated and preserved? If open textbook publishing is to be successful, new, sustainable business models will need to be developed. In particular, some form of government subsidy or financial support for open textbooks is probably going to be essential. Nevertheless, although these are all important concerns, they are not insurmountable problems. Just getting a proportion of the main textbooks available to students for free is a major step forward. BC campus has mounted a short MOOC on the P2PU portal on Adopting Open Textbooks. Although the MOOC may not be active when you access the site, it still has most of the materials, including videos, available. The harmonized Tri-Agency Open Access Policy on Publications requires all peer-reviewed journal publications funded by one of the three federal granting agencies to be freely available online within 12 months. Also in Canada, Supreme Court decisions and new legislation in 2014 means that it is much easier to access and use free of charge online materials for educational purposes, although there are still some restrictions. Commercial publishers, who have dominated the market for academic journals, are understandably fighting back. Where an academic journal has a high reputation and hence carries substantial weight in the assessment of research publications, publishers are charging researchers for making the research openly available. The kudos of publishing in an established journal acts as a disincentive for researchers to publish in less prestigious open journals without having to pay to get published. However, it can only be a question of time before academics fight back against this system, by establishing their own peer reviewed journals that will be perceived to be of the highest standard by the quality of the papers and the status of the researchers publishing in such journals. Once again, though, open research publishing will flourish only by meeting the highest standards of peer review and quality research, by finding a sustainable business model, and by researchers themselves taking control over the publishing process. Over time, therefore, we can expect nearly all academic research in journals to become openly available. In 2004, the Science Ministers of all nations of the OECD, which includes most developed countries of the world, signed a declaration which essentially states that all publicly funded archive data should be made publicly available. Following an intense discussion with data-producing institutions in member states, the OECD published in 2007 the OECD Principles and Guidelines for Access to Research Data from Public Funding. The two main sources of open data are from science and government. In science, the Human Genome Project is perhaps the best example, and several national or provincial governments have created web sites to distribute a portion of the data they collect, such as the B.C. Data Catalogue in Canada. Again, increasing amounts of important data are becoming openly available, providing more resources with high potential for learning. The significance for teaching and learning of the developments in open access, OER, open textbooks and open data will be explored more fully in the next section. 1. Check with OpenStax College, the Open Academics Textbook Catalog and the B.C. open textbook project to see if there are any suitable open textbooks for your subject. 2. What open journals are there in your subject area? (The help of a librarian may be useful here.) Are the articles of good quality? Could your students use these if they were conducting research in this area? 3. Ask your librarian for help in looking for open data sites that might have useful data that you could use in your teaching. Would students be able to find these data sites by themselves, with just a little guidance? How could they or you use this open data in their learning? 10.3 Open textbooks, open research and open data by Anthony William (Tony) Bates is licensed under a Creative Commons Attribution-NonCommercial 4.0 International License, except where otherwise noted.